Freddy Kroger is gone- the Kroger store on Wayne Avenue, long known by a whole list of aliases- because of its disgusting appearance- is no more. Now, we’re greeted with clean floors, a well lighted store with clean ceilings, new colorful graphics around the perimeter and shelving that seems a bit more modern. The deli/bakery area still seems a little dark and mysterious compared to the appearance of a newer Kroger Marketplace, but overall, it’s a lot nicer. My mother, 83, still thinks it’s a wonderful place. She’s always impressed with the produce- and finds the staff more than helpful at getting special orders like buckwheat flour, or buttermilk dry mix. The parking lot is still a bit dangerous with the steep pitch that can turn a grocery cart into a soapbox derby demolition car- and the outside signage still looks a little rough- but, overall- it’s not an embarrassment to Kroger- or the neighborhood anymore. What’s sad is that the Kroger Company didn’t do this long ago. Had they invested the pittance they did- maybe we could have avoided going on the wild goose chase for a “new and improved” super Kroger at the corner of Wayne and Wyoming. The city, without a contract or a performance guarantee by either Kroger or the “developer,” Midland Atlantic, went on a 6 year calamity course. First- they tried eminent domain to aggregate over 80 lots to make room for the new store. Then, when the Supreme Court ruled that eminent domain for private business was a long stretch, went on a mad spending spree. First- they declared the neighborhood “blighted” to guarantee that it would be as people would defer maintenance on their soon-to-be-torn-down homes. Then, multiple appraisals, multiple options to buy, and a whole bunch of money and time spent. Then, buying the corner buildings for $800,000 as the final step in their grand plan- only to be told by Kroger- sorry, we’ve changed our mind. All this- in spite of the property that met the requirements over on Brown Street- and a plan floated by local developer Jeff Samuelson- utilizing the former Cliburn Manor DMHA space- which is now another empty field of dreams. So, as the bulldozers did their job yesterday- probably costing the taxpayers at least another $50K- we did what we’re so good at doing in Dayton these days- built yet another empty lot. Of course, we’ll be lucky if the-cash strapped city can mow it more than twice a year- despite the millions wasted on this wild goose chase. Had we spent the millions on appraisals on refurbishing the Ecki building and seeded the neighborhood with incentives to fix and upgrade the properties- we’d have been better off. Of course, if Kroger hadn’t let Freddy take over the store- we’d have avoided the whole mess. Kroger has been a horrible citizen in the city of Dayton- with the abandoning of the Gettysburg store after a less than 20-year run. The Wayne Avenue and the Smithville Rd. stores always looked like poor stepchildren to the suburban stores. But, that’s the advantage of being the only national chain around. I’ll be very disappointed if the city gives the corner over to Kroger for one of their gas stations- Kroger doesn’t deserve any favors at this point. In fact, they should take responsibility for the planting and maintenance of this corner for as long as they operate at the current location. It’s the least they could do in return. Let this serve as a case study of how to always have an exit strategy before investing public dollars in private ventures- our investment should have strings attached, at least a guarantee of matching dollars returned to the community for any investment we make. Previous Post: Insurance free health care in Dayton? Yes David the Ecki building is history, whats more so is the pigeon coop and weather vane that was at the end of the building, and if memory serves you correctly, I had talked for years at the Historic South Park meetings about saving them (the pigeon coop) with not so much as a rise from the members. Shame on the tasteless organization! On the bright side of the blighted area, I did get a two step limestone carriage stone (one of three in Dayton), and a whole mess of vintage wooden window, door trim, and baseboard. Though I share your sentiments about the corner, it was a pretty good score for The House of Sizer, and another typical loss for Dayton. David, I agree with your assessment about the mad spending spree and also about Kroger being an irresponsible citizen of Dayton. It amazes me that Dayton went on the spending spree without any contracts in place w/Kroger. However, eminent domain has been upheld for governments to take land, “with just compensation” and turn it over for private development. See the landmark (and I think bad decision) U.S. Supreme Court case Kelo v. City of New London, 545 U.S. 469 (2005). The whole case is available here: http://law2.umkc.edu/faculty/projects/ftrials/conlaw/Kelo.html. I bet that Whole Foods builds a store on this property. After all, South Farce, was “neighborhood of the year” in 2008. Meanwhile, a well-placed friend in the AIA told me something interesting about the status of the Arcade “project”; but given the malevolent power of over-the-transom architectural office shop talk, I will refrain from repeating what I have heard. David, I beg to differ with your view of Kroger being a horrible corporate citizen regarding the Kroger Gettysburg store. The following statistics are from the 45417 zip code (Gettysburg Kroger), per CLRSEARCH.COM: Population has declined from 1990-2009 by 31%. The pecentage of population with a household income of $25,000 or less is 46%. The percentage of vacant housing inventory is 19.6%. The crime risk index for robbery is eight times the national average. Kroger is not in the business of closing stores, but just as McDonald’s decided lower Salem Ave. wasn’t necessary for their balance sheet, Kroger made a business decision on behalf of their shareholders. The six year time line on the Wayne Ave. site is self-explanatory. There is an old adage in commercial real estate, “Time kills deals”. Gone from Dayton, I suggest you look at Norwood vs. Horney. This was the case that created the acquisition problems for the City of Dayton and Mid Atlantic. In this case, the Ohio Supreme Court unanimously held that the City of Norwood ‘s attempt to take a private home for a private development violated the Ohio Constitution. This case, and it’s timing, was the kiss of death for a Kroger at Wayne and Wyoming. Bobby: Thanks for the case! I’m always open to being educated and appreciate the resource. I’ll look it up and get back to you. As far as I know, there was no eminent domain action on Dayton’s project. This has not occurred anywhere in the region in a long time, except for transportation projects. Bobby is correct that the Norwood case made eminent domain illegal for economic development in Ohio – even though it is legal on the federal level. Also, to say they spent “millions” is probably an overstatement since nothing actually happened. The costs you mention simply don’t add up. CSAPT, In Norwood vs Horney the Supreme Court ruled that an Ohio statute allowing for the use of eminant domain seisures of “deteriorating areas” was void for vagueness. The case was brought before the court in 2006. Whether the city attempted to used eminent domain or not is irrelevant. They lost the leverage of using the implied threat of emminant domain with the remaining holdouts who thought their piece of the rock was a lottery ticket. That’s one way to skew the story. Another is that these homeowners didn’t think they were being offered enough money for the disruption of the lives and that what they were being offered wouldn’t have enabled them to buy houses elsewhere. @ David Lauri, You are correct. Your scenario is plausible also…. I apologize for the spelling errors. Mr. Esrati knows about the Arcade “project”. He is, however, reluctant to broach the subject without clearance from his controllers, who mandate that everything about Dayton be sufficiently prosiac. Well Abner, Mr. Esrati redacts all citations of his handlers, whose names I won’t expose because he’ll… well… redact them. He sent me a hyperventalated e-mail of denail. I had to wring it out because it was drenched with fop sweat. There are instances, never the less, of Mr. Esrati’s prostrations before his lieges on this very site. One of them is a video, in which Mr. Esrati looks more nervous than a quality controll technician at an electric chair factory. Why do people pick on you David, you’re one of the good guys in Dayton? Walked by the empty hole today, on my way down from UD. 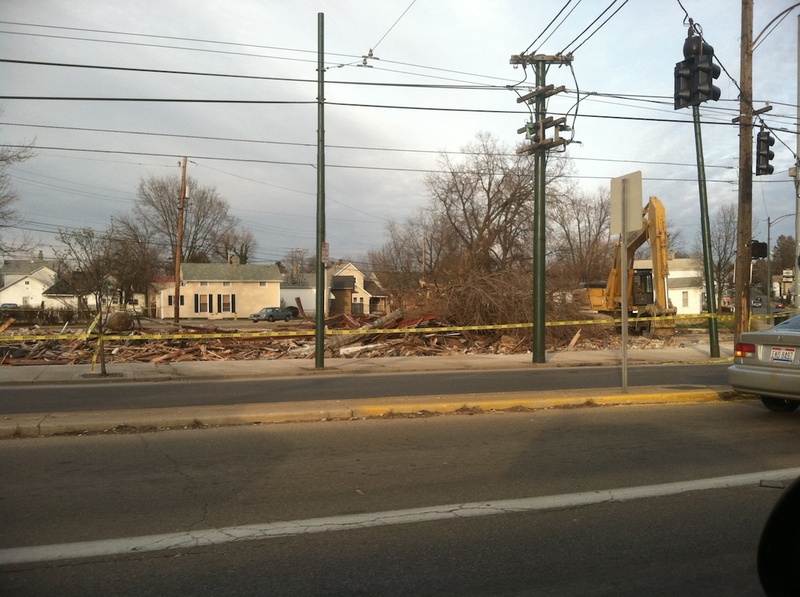 Yet another landmark building gone. IF you want to see another sorry case check out the Troy/Valley intersection. Some good urban set-pieces on their way to the wreckers ball, too (sooner or later, since they are boarded up). The thing about the Ecki Building is the development plans always seemed questionable in the demolition aspect, since the city did save that commercial building at Salem/Grand, which also was mostly empty and had fire damage. Yet that was a no-can-do in the case of Wayne & Wyoming. No matter. The deed is done. Interesting that the city felt it had to really spend that demo money on that particular building, considering the cities supposed priority system was to demolish nuisance abandoned properties in the middle of residential districts, so they wouldnt be problems for neighbors. Seems Ecki would have been a lower-priority demolition. Almost like the city government types wanted to flash the bird at the preservations and anyone else who cared about that building. No one can tell me this was a deliberate move to remove that sliver in the finger or pop that particular political zit. Now the pitch is to market it for maybe another gas station site or fast food place. Or something like that. Those old neighborhood retail places are pretty much obsolete these days. There’s a good book on this that talks about the destruction and fade of cities like Dayton: City: Urbanism and Its End. The book is about New Haven, but it could just as well be about Dayton. Urbanism and its end. The operative words. These demolitions are just a mopping-up action.